Welcome to Project AGORA! 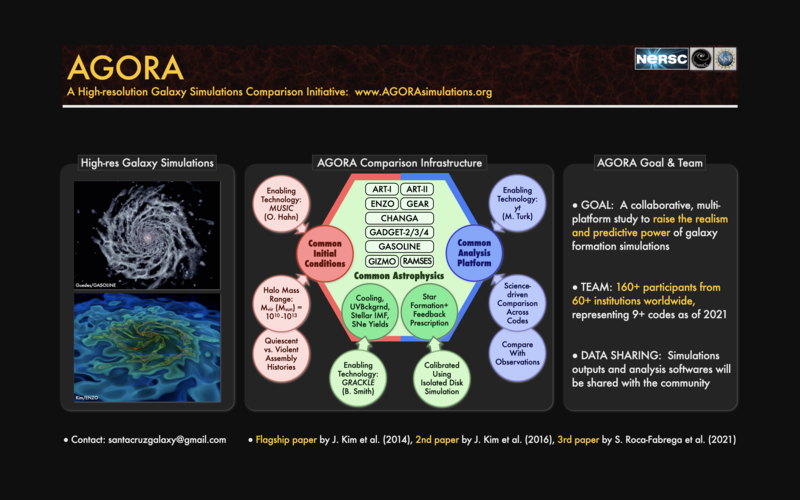 We investigate galaxy formation with high-resolution simulations and compare the results across code platforms and with observations. This is an one-of-a-kind, inter-institutional effort by more than 160 participants from over 60 institutions worldwide (as of 2019). We welcome anybody who is interested in participating in the Project. Click the image on the right to see an one-slide intro to the Project. ● The 8th annual Workshop of the Project was held at UC Santa Cruz, Aug. 9-10, 2019. ● Consider joining us without any obligation, especially if you are looking for the common ICs and analysis scripts used in the Project. Contact us if you have any other question!